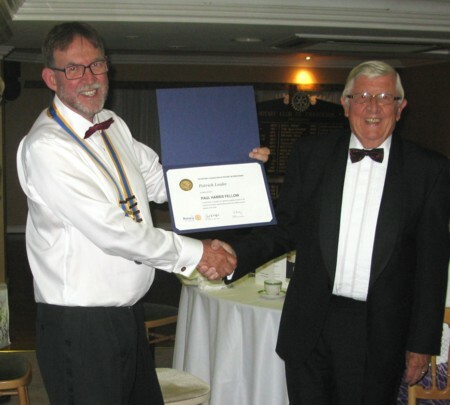 Over the years, the Cranleigh Rotary Club has awarded Paul Harris Fellowships - the most important honour given by Rotary - to people who have made important contributions to the Club and the local community. 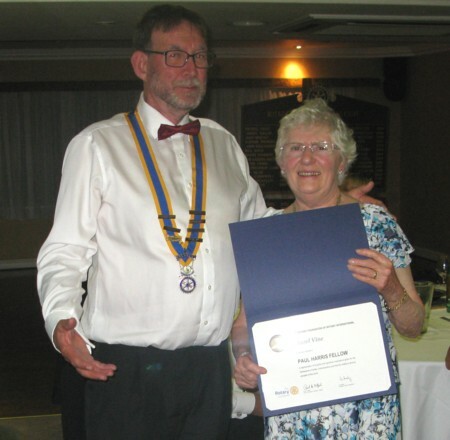 The most recent awards, presented by President David Hall on 23 June 2018, were given to Cranleigh Rotarians Patrick Leake (left) and Brian Vine (centre), as well as Brian's wife, Hazel (see photos below). 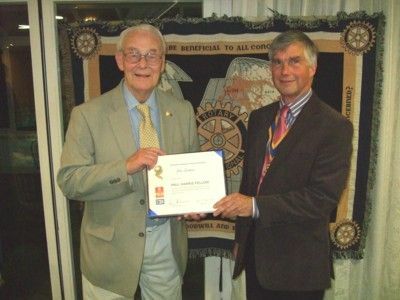 Patrick Leake has served as President of Cranleigh Rotary on two occasions. He has been an enthusiastic supporter of Club activities and continues to play a key role in promoting the Club in the local community and seeking out nhew members. Brian Vine served as Club President in 2011-12. Over the years, tens of thousands of pounds have been raised for Rotary charities through his hard work and dedicated service to the Club, particularly by organising major fundraising events for Rotary charities such as the annual 10K Race. In all of the events that Brian has organised, Hazel has been his right hand woman and an indispensable partner, helping whenever and wherever necessary - and we are most grateful for her invaluable contributions. 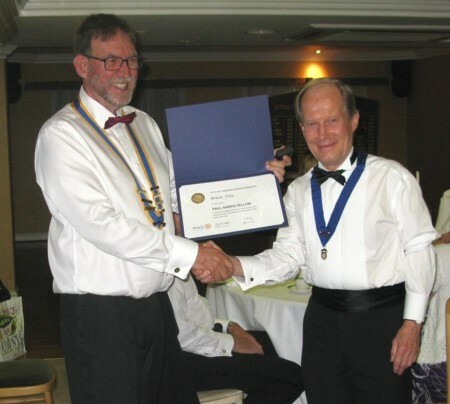 Previous recipients of Paul Harris Fellowships include Cranleigh Rotarians Tom Cornwell and Andrew Kolmar, who received their awards on 17 March 2017 (see photos below). 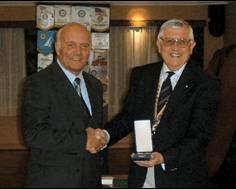 Tom Cornwell was President of the Club in 1981 and 2015, and he has supported the club and the Rotary organisation over many years. He has held a variety of Club posts throughout his time. Of particular note are the four Model Railway exhibitions he has organised at different times, raising over £2000 per show in aid of St Christopher’s hospice. And his shop, Celebration Cakes, makes the best bread in town! Andrew Kolmar joined Rotary in 1995. He has served on most committees and was Club President in 2000 and 2008. He participated in the London Triathlon in 2005 and raised £12,500 to purchase computer equipment for the young people of Romania. Andy discovered he liked running and entered the London Marathon in 2016, raising £2,700 for Amber. He also led a party of Rotarians and young people on a 3 Peaks Challenge in 2012 and was a District Organiser of an International RYLA in 2012. Our club's first award was given to men's hairdresser Roy Redford, who raised many thousands of pounds for numerous charities by taking part in marathon races around the world. A second award was presented shortly after to Peter Spring, who was one of the founders of Task Force Romania, a local group of volunteers who regularly visited the eastern European country to provide facilities and other support for its numerous orphans and deprived areas. On 23 February 2005, the award was given to Sallie Bushen, a founder member of the local Motor Neurone Association, of which she had been Chairman since 1994. During that period, the branch had raised £400,000 to support patients and carers, and assist with medical research. 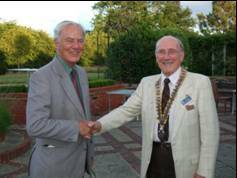 Another Paul Harris Fellowship was awarded in April 2005 to local businessman Nick Vrijland, who became a trustee of the Cranleigh Village Hospital Trust and an enthusiastic supporter of the campaign to build a new village hospital. 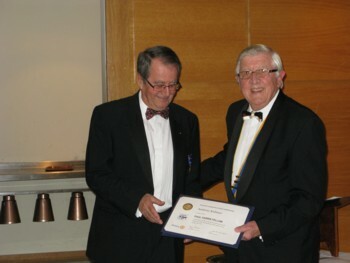 Michael Frost, a founder member and first President of the Rotary Club of Cranleigh, was given the award on 26 June 2008. Michael was first approached by the Rotary Club of Guildford in summer 1969 about creating a new club in Cranleigh – then a fast-growing village. 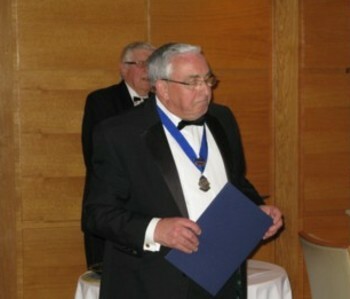 On 28 October 2010, John Graham, another founder member of the Cranleigh Club and a former Club President, was awarded a Paul Harris Fellowship for his long and faithful service to the Club and to the local community. Paul Harris Fellowships are awarded to those who have made a special contribution to the local community over many years of hard work and selfless dedication.